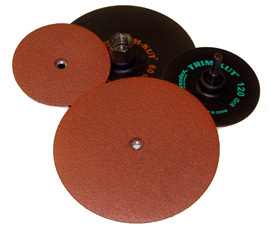 Trim-Kut discs are ideal for light sanding and surface conditioning applications. The plastic back allows self-trimming to assure a constant fresh edge. The 3" diameter and 5" diameter discs come with a 1/4" straight shank that can be used in wide variety of tools from drills to those with collets. The 4-1/2" diameter discs have a 7/8" arbor hole, and are designed to use with a right angle grinder. Adaptors are available at the bottom of the list that will allow you to use Trim-Kut discs with right angle grinder tools.